Looking for a Certified Pre-Owned Mazda? Come to Piazza Mazda of West Chester! The most rewarding type of publicity a business specializing in customer service can get is word-of-mouth advertising. This interpersonal publicity creates an excellent outcome for local Pennsylvania dealerships like Piazza Mazda of West Chester. 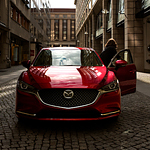 The success our Mazda dealership has achieved is through a firm foundation of loyal, satisfied customers. Without them, we wouldn't be where we are today. Welcome to Piazza Mazda of West Chester! We are here to make sure you find that special vehicle that will surely change your life. We have plenty of exciting Mazda vehicles in store, including the spectacular Mazda CX-5. Drivers from Philadelphia to Broomall can find Mazda CX-5's for lease in our new inventory, as well as plenty of other options in our pre-owned inventory as well. 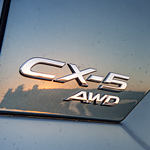 Why is the Mazda CX-5 recognized for being a popular crossover SUV? Take a look at a couple safety features to discover why. Your Mazda CX-5 has a feature making it safer when you are moving in reverse. Once you shift your vehicle in reverse, the Cross-Traffic Alert scans both ways to see if any other vehicle or a pedestrian will be walking into your path, alerting you so you have enough time to proceed more cautiously. The Pre-Collision Assist feature is designed to identify a collision risk and help stop your vehicle if needed. The Mazda CX-9 is a popular 3-row SUV with an elegant design. Its eye-catching design attracts many different types of drivers from families to singles. Two of the top technology features of the Mazda CX-9 are available predictive i- ACTIV AWD and smartphone integration. Our team at Piazza Mazda of West Chester can go over other top features of this vehicle if you're interested. 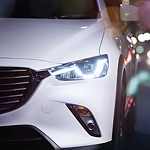 The 2018 Mazda6 is a great option for drivers who frequently take to West Chester streets at night. This popular mid-sized sedan is available with high-tech features that will improve visibility at night. Automatic High Beam Control is useful when you're driving on long stretches of empty road. The car will automatically switch to high beams whenever possible so that you can see your surroundings better. If another vehicle approaches, the system will revert to standard lights. Also available is the Adaptive Front Lighting System. It's designed to help you see around corners. Life here in West Chester can be hectic, demanding a lot from our vehicles. We need a dependable, durable vehicle that can serve our practical needs from one day to the next. This of course leads most of us to choose an affordable, practical vehicle as a result. The common sense and frugality of most people here also means that a reasonable price is also quite the priority. Unfortunately, most engineers out there omit many modern features, thinking they don’t belong in a down to earth, simple vehicle. 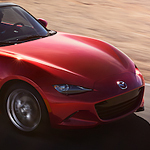 Take a closer look at the new Mazda MX-5 Miata and you'll discover why its a popular convertible roadster. The all-new Mazda MX-5 Miata comes with the Cross-Traffic Alert feature for helping increase vision behind your vehicle. One the car is in reverse, sensors monitor for a vehicle traveling behind your car and will alert you to stop moving and proceed with caution until that threat is no longer detected.